You may met before, when you enter a webshop, you already got a popup which wants your email address. It’s like you have had your first eye contact with a girl, and next moment you want to take out her phone number. Of course you won’t get it! If you had chatted and laughed together and she has positive experiences with you, maybe she will give you her number. It’s the same with pop up. With an attractive offer in a right time, you can get the email address. Let’s see in practice! The smart pop up email collecting process is useful for every website, and this is especially true for the webshops. In an average webshop 97 out of 100 visitors disappear without converting. This is annoying statistics, because you have paid for all of your visitors through ads or with your own work through a search-optimized website. Anyway, you have paid. I suggest you to use email collector pop up which doesn’t worsens your site primary conversion goal. It means that if you have a webshop, you shouldn’t bother the buying process with an email collector pop up. If you are an online media owner, let the users to browse. If you bother them at wrong time with a pop up, than maybe you irritate them instead of let them read more. So you should use the pop up when the user wants to leave your website. Then you don’t lose the primary conversion goal, just try to win them for a secondary conversion. The exit-intent applications give you a great solution. The pop up appears when the user wants to close the page. I tested a few exit-intent pop up applications from the market, these are the OptinMonster, the HoldOnStranger, the Picreel and the OptiMonk. The OptinMonster gives you good solutions but the price was too high. You can get a subscription from $199/month. It’s not the best deal for the small companies. The HoldOnStranger was a bit jerky. Difficult to use it, because you have to give the url-s individually where do you want to activate the pop up. The price was friendlier, $29/month, but they offer anual billing, so you have to pay the whole year. $348 is a little expensive if you want to start with a test. I couldn’t control the frequency of the appearance. It has only once, daily, weekly and monthly presence possibilities. It would be more logical if I can give the max appearance for one user. I prefer 3 appearance, at the first time he is scared and close the pop up, at second time he start to think about the offer, and at third time maybe he subscribe. Anyway it does not make sense bother him anymore. Of course we should test the frequency as well, but these app is not flexible enough for me. The second thing I dismissed the Picreel that, the trial version is not the same as the full version. I couldn’t test all functions. For example: I couldn’t pass the subscribers data into my email marketing software. So I couldn’t test how fast are the data synchronising, and this is very important for me. The price of the Picreel is much cheaper than the others, you can get a one month subscribe from $19, and most of the functions are available in this cheapest version as well. Finally I have choosen the OptiMonk. It contains everything what I missed from the others. It has a 14 days trial version with full functionality, and this time is more than enough to test every feature. The cheapest subscription is $29/month, so the price is OK.
You can integrate it with your newsletter software, so the subscriber’s data will syncronize with your list. If you use MailChimp, you can send hidden field also. 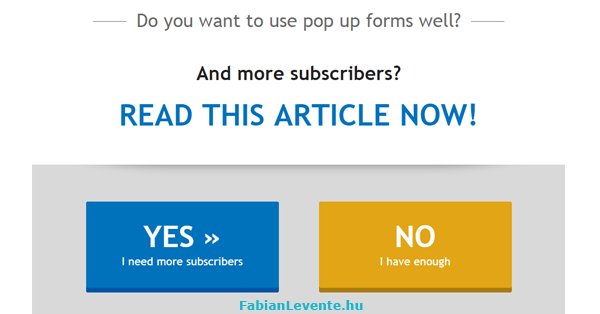 This option helps you to follow who came from pop up, and you can send automatic newsletter offers, trigger by the subscription form location. You can adjust which url you don’t want to make live the pop up. For example if somebody already has seen the ‘Thank you for your newsletter subscribe’ page, you don’t want to show him the subscriber pop up. It can pass the clicks data to Analytics, so you can optimize better your pop up campaign. You don’t need developer. You can start a campaign in a few minutes. Depends of the offers, I experienced 5-27% conversion with the OptiMonk. So continuing the webshop example from 97 bounced visitor you have chance to convert 5-26 visitor with it. I suggest you to try the OptiMonk free version for 14 days! I hate spams, I never share your data with a third person.